The Wine Country Racing Association (WCRA) treated the Okanagan Valley to another drag race Sunday, at Osoyoos’ airport. A weekend filled with all sorts of car shows and events to entertain the automotive enthusiast culminated with the following drivers gracing the winners’ circle. Mason McCune made his car club, The Detonators, proud by dragging the trophy home to Enderby. McCune drives a 1989 Ford Mustang. Dean Martin, currently living in Castlegar, has the bragging rights this week by topping the Pro Bracket with his 1967 Camaro. 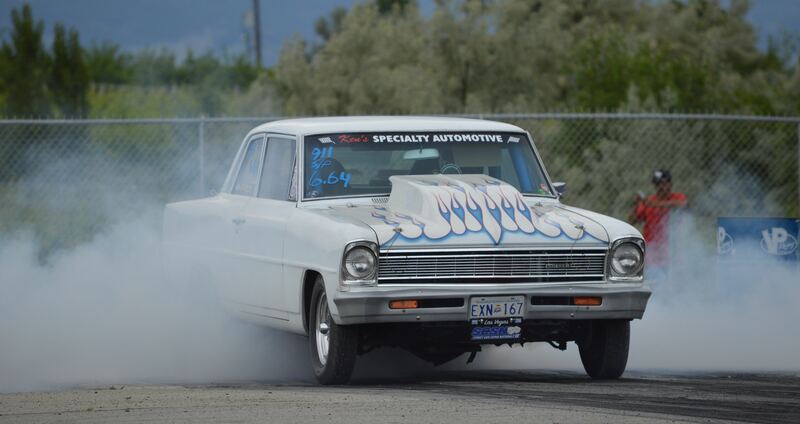 Michael (Bucky) Stewart of Langley adds yet another piece of drag racing jewelry to his bragging wall by out-racing the others in his 1967 Chevy II. The Americans take a trophy back across the border with them this go around. Bob Henrie (Conconully, WA) bested the competition in the bike/sled bracket on his 2009 Polaris IQR. This week’s best reaction time is an absolutely perfect .500 light. Hometown racer, Brad Baxendale (1984 Camaro) kept the RT trophy in Osoyoos. Father’s Day Sunday is the next event at Richter Pass Motorplex. Treat Dad to a special day at the track. Gates open at 9 a.m. on race day. Newcomers are welcome and encouraged to show up early for registration and technical inspection. Visit www.winecountryracing.ca for more information.